THE COMPLEXITY OF REAL LIFE ALWAYS GUARANTIES AN OTHER SOLUTION. The complexity of real life always guaranties an other solution. 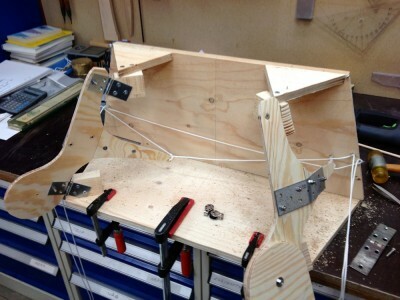 Looking at my mock-up I realized that I could make a better rudder arrangement. Seeing Marströms catamarans with their connecting bars for seven years I took it for granted that twin rudders needed a connecting bar. One is blinded by preconceptions and hidden assumptions. This is not the first time. For example 1968 I bought an old wreck, named her Duga intending to do as Captain Joshua Slocum converting her into a world cruiser. Below: Duga as a wreck. She was built 1885 as an steam launch. Click once or twice to enlarge. 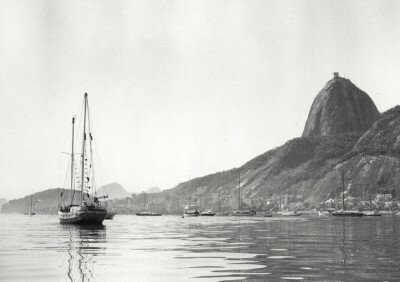 I sailed Duga to Rio de Janeiro Brazil 1969 – 70. She was later sold in Florida. I rigged her as an staysail schooner. To prevent her making leeway I gave her a daggerboard. She sailed well. Duga had her rudder post inboard. I gave her wheel steering and placed the quadrant behind the rudderpost as I had seen on other boats. 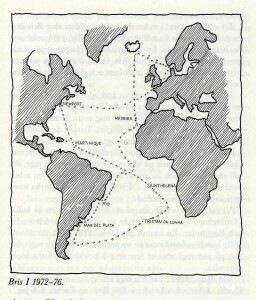 A map showing some of Bris passages. 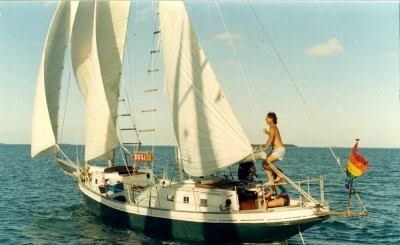 Later I sailed her to Newport RI where I donated her to the Museum of Yachting. Bris in Mar del Plata Argentina with a girl freind. The stainless pipe construction holding the blocks for the steering arrangement can be seen. Click once or twice on the picture to enlarge. 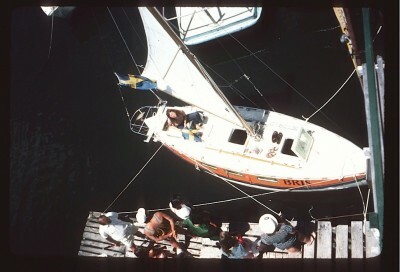 Then one day many years later back in Sweden standing musingly looking at her I realized that I could have turned the quadrant 180 degrees and would not have needed the stainless pipe construction, that although had worked fine had been unnecessary and a worry in ports being fragile compared to the rest of the boat. One is blinded by preconceptions and hidden assumptions. 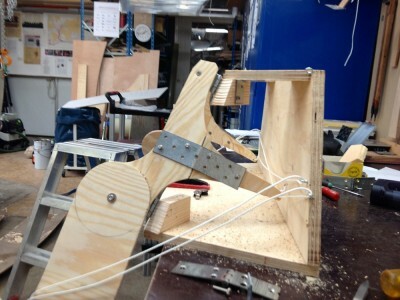 Now as I was looking at my mock-up I realized that if I bent the tillers toward each other I did not need the telescopic connecting bar the universal joints and all that. The bending would put the tiller more to the center and I would get the needed distance between the quadrant and the steering blocks. 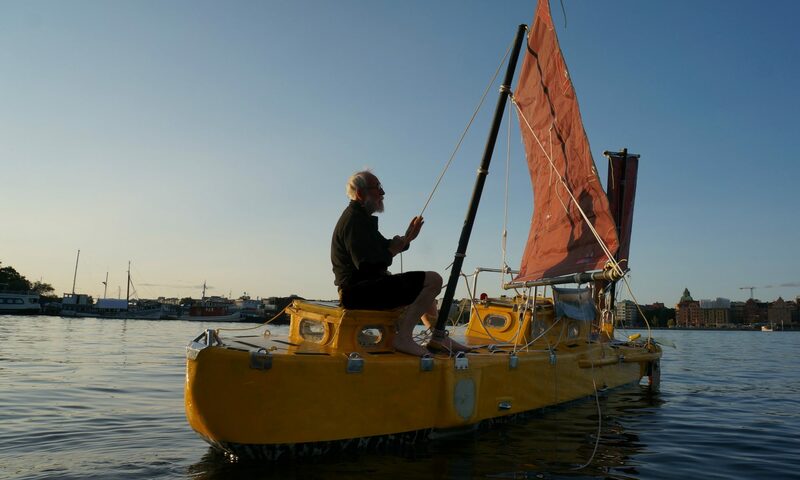 The rudders would then move in parallel by holding two two leeward pulling lines together on one side and the two windward pulling lines together on the other side. When I liked to use the rudder as sea-anchor the steering ropes would let me be able to put them in V-position acting as brakes. Pictures below. If you do not follow I have not expressed myself clear enough and more will follow. Do I spend to much time solving problems? No – nothing is as much fun as solving problems. By evolution man is a survival machine. The Swedish lifestile means that the gouverment solves all your problems and in exchange you are a slave working to make the economy grow. The idea is that entertainment and comfort shall make you happy. Most people spend their life waiting for something. My planned voyage is a thing to hang up problem solving on. It creates a problem rich environment. That will help me to reach the higher spheres of happiness. The voyage has already started. Planning designing building and sailing is not to be seperated.